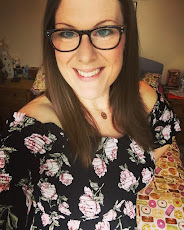 As a family we have been shopping almost exclusively at Aldi now for around 6 months - in that time we have managed to halve our food shopping bill, saving us around £30-£40 per week. This saving has been a godsend mainly because we are now having to survive as a family on just one wage as I'm no longer working and am at home with Bert full time. Financially, it is a struggle, but, it is absolutely worth any financial hardship - I keep telling myself that the 5 years up until he goes to full time school will be here far too fast for my liking, and that I just need to concentrate on soaking up and enjoying every single moment of being at home with him, and in the meantime we need to be as sensible as we can with money to make ends meet. One of the ways parents can save a decent amount of money each week is by swapping branded products in their weekly shop to supermarket's own brand products such as Aldi's Mamia Ultra-Dry nappies. 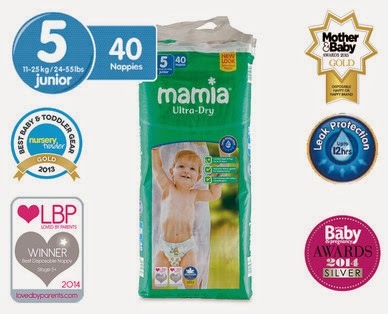 You can buy Aldi's Mamia Ultra Dry nappies in all the standard nappy sizes: size 3, 4, 5, 5+,6 and 6+, and they come in various different sized packets - 30, 36, 40, 44, 48, 56. Aldi also sell newborn nappies in size 1 and 2, as well as Pull Up style Easy Pants in sizes 5 and 6 for potty training. Aldi really do cater for all of your child's nappy-wearing needs! We usually buy Pampers Active Fit nappies in bulk (136 nappies at a time) from Amazon, which costs us £19.39 working out at 14p per nappy. 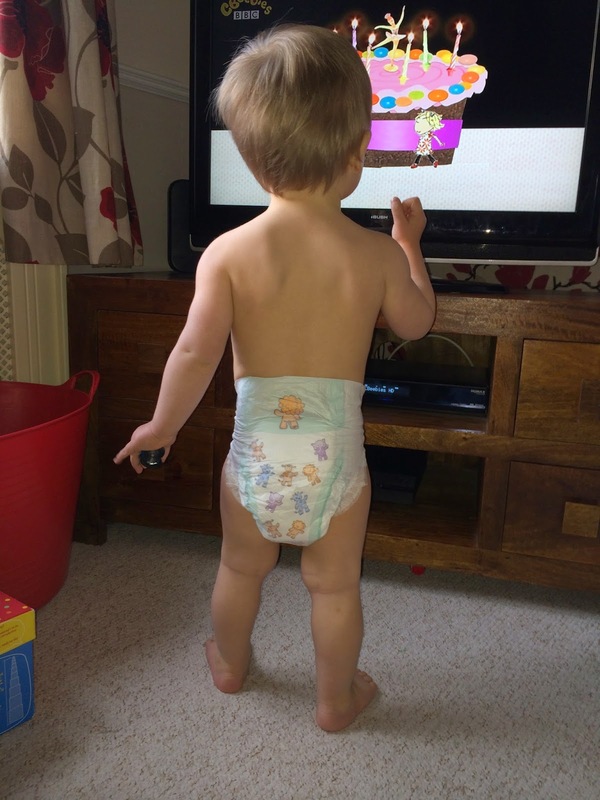 We have found this the cheapest way to buy the popular branded nappies, and for me they have been the most reliable nappy that we've used so far. When Bert was smaller, we tried Sainsburys and Tesco's own brand nappies, but found them all to be less absorbent and more likely to leak than the Pampers, so we decided to stick with the branded nappies that seemed to work better for us. Then recently Aldi contacted me asking if I would consider giving their nappies a try. They sent us a 40 pack of their Size 5 (Junior) Ultra Dry nappies and we've been using them through December/January to see what we think. The Ultra Dry nappies size 5 cost £4.49 for 40 nappies working out at 11.2p per nappy, so by swapping to the Aldi brand nappies we would be saving 2.8p per nappy - it might not be a huge saving, but it is £5 a month we could spend elsewhere. It is also worth noting that if you buy branded nappies directly from your supermarket (rather than in bulk from Amazon like us) then your saving will most likely be much bigger, as the branded nappies at the supermarkets often work out to be around 20p per nappy, in which case you'd be saving 8.8p per nappy by switching to Aldi. The Ultra Dry nappies seem to fit Bert well, but are slightly more bulky in the pad than the branded nappies we normally use. This doesn't seem to bother Bert at all, and the change to these new nappies hasn't worried him in the slightest. 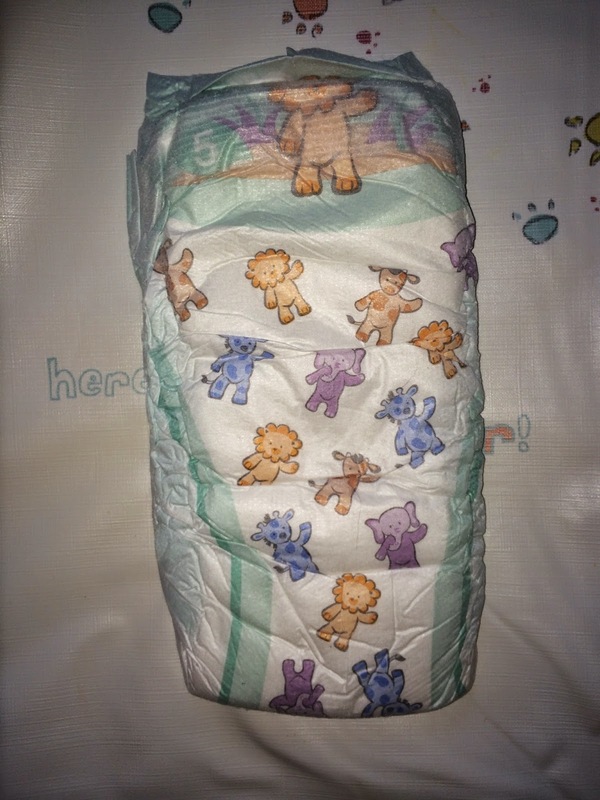 Each nappy has a really cute fun design on, in fact, I like the design much more than the ones on the branded nappies - the cartoon animals are much clearer than on the Pampers nappies and Bert makes a cute little roaring sound when I point out the Lion on his nappies....sweet! The front of the nappy is clearly labelled with the size (5) and the resealable tabs are brilliant for ensuring you get a good snug fit when trying to change a very wriggly toddler like Bert. The outside of the Aldi nappy has a slightly more papery texture than the softer almost fabric-like outer of the Pampers nappies we are used to using but again, this doesn't seem to trouble Bert at all. I'm not overly keen on how it feels when I change him, the outside papery texture seems to almost stick to my hand when I touch it (think velcro!) and I just find it a bit icky. This would be a stupid reason not to buy the nappies when they're saving you good money though as they don't affect the performance of the nappy at all, its just me being weird with textures! In terms of performance I have found the Ultra Dry Nappies to be mostly very reliable. In the month that we've been using them exclusively Bert has only leaked a small amount of wee three times and each time it was his overnight nappy that leaked. He'd been in the nappies for 12 hours + each time, and there was a slight leak at the top of the nappy around one side, which had seeped a little onto his vest. For me, this isn't a huge issue, as I always give him a fresh vest and clothes after his first nappy change each morning, and I rarely expect any nappy to be much good after over 12 hours anyhow, Aldi promises UP TO 12 HOURS protection, and I'd say that promise is delivered with these nappies. I'm used to the odd leak here and there, even with our usual nappy brand, so the Aldi Mamia range seem to stack up pretty well! So what’s so great about our Ultra Dry nappies? 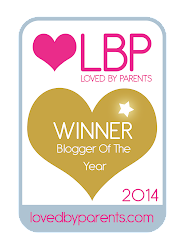 The Mamia Ultra Dry nappies are multi-award winners having received a Gold award from Nursery Trader in their Best Baby Gear category 2013, Gold award in the Mother & Baby awards 2014, Silver award from Loved By Parents in their Best Disposable Nappy category 2014, and finally a Silver award from the Baby & Pregnancy Awards 2014. 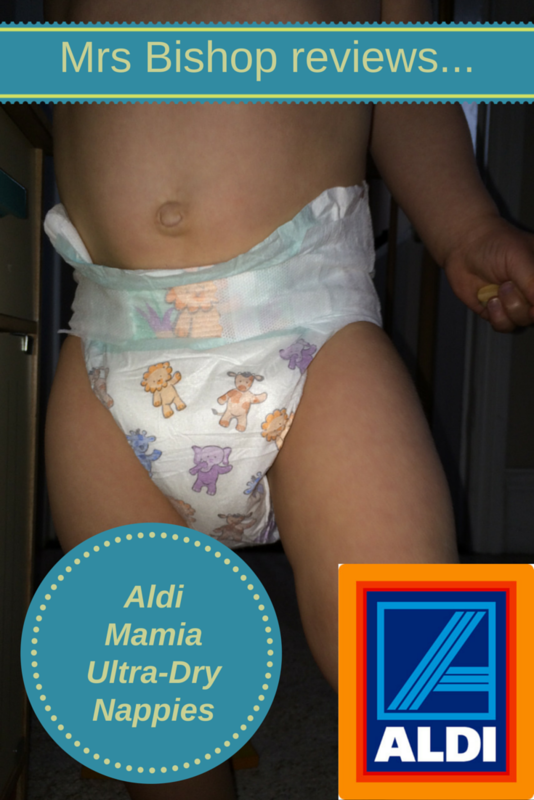 Aldi Mamia nappies are a great fit! 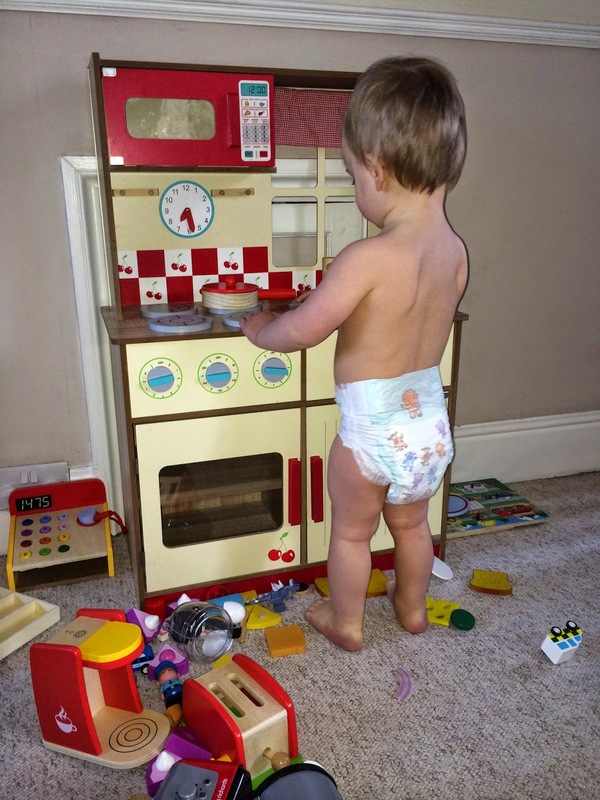 My little nappy-clad rascal - in amongst his kitchen chaos! I think that these nappies are a great lower-cost alternative to their branded contemporaries; they offer a reliable nappy for up to 12 hours, a good fit and design, while best of all saving us parents a pretty penny or two! Disclaimer: We were sent a 40 pack of Aldi's Mamia Ultra-Dry size 5 Nappies for the purpose of this review. All words and opinions are my own. Fulfilled by Amazon PRIME ! The concept of stretch panels was also introduced by Pampers as this guaranteed that babies were more at ease and enjoyed better comfort.